Cooking for your family—made fun! -they're low on sugar and made with whole wheat flour to give you longer-sustaining energy. -the batter can be prepared the night before (just cover with plastic wrap, making sure the plastic wrap is pressed directly onto the batter). - cooking them will fill your home with holiday smells that bring everyone to the table. - since pancakes require hands-on cooking time, you can use your other hand to down a much needed cup of coffee. 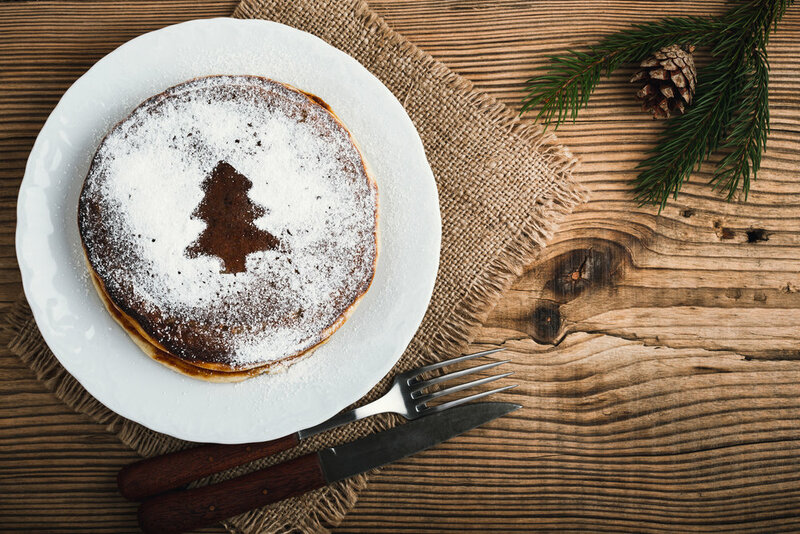 These pancakes can get dusted with a sprinkle of powdered sugar (place a cookie cutter shape on top to make them extra festive), or served with real maple syrup. Our only plea is to avoid imitation syrups that are loaded with high fructose corn syrup. The real stuff isn't refined so it won't cause as dramatic a blood sugar spike and crash--and the real stuff is so sweet that you can actually use way less--a tablespoon is plenty! Serve with fruit and eggs or breakfast sausage to add in fiber and protein and round out the meal. And coffee. Lots of coffee. Another bonus: The dry mix (from whole wheat flour through brown sugar) makes a great holiday food gift if you're short on time and don't feel like baking. Procrastinators, rejoice! In a large bowl, whisk together the dry ingredients: flour, baking powder, ginger, cinnamon, nutmeg, salt, and brown sugar. In a small bowl, combine the we ingredients: milk, egg, molasses, and butter. Pour wet mixture into the flour mixture and stir just until the mixture is fully combined. Do not over mix. Heat a non stick pan over medium-low heat. Grease pan with butter or non stick cooking spray. Using a 1/4 cup measure, pour batter onto griddle and cook without touching for 2 minutes or until the top of the pancake starts to bubble. Flip, and cook for 1-2 minutes more until both sides are golden brown. Repeat until all pancakes are cooked. Peasful Kitchen was started as a social place for like minded parents to connect, learn, and enjoy making food for their families. We have since grown from a baby food company to a complete website that covers every stage of a families growth — from freezer meals for expectant moms, to baby and toddler food, to family dinners that bring smiles ( and sanity!) to your table. Whether you’re a new mom who wants to serve your baby real food from the start, or you’re a veteran parent who wants to put more nutritious meals on the table, we can help you make dinnertime more do-able. Join us, and experience the confidence and pride that comes with taking the step to make your family healthier and happier.